Wednesday, August 5, 2015. David Jae-Weon Huh (Korea), Second Prize and Silver Medal. Jianing Kong (China), Third Prize and Bronze Medal. Juan Pérez Floristán, Canon Audience Award. Photo: Elena Torcida - From left to right: Floristán, Huh and Kong, First, Second and Third prize respectively. 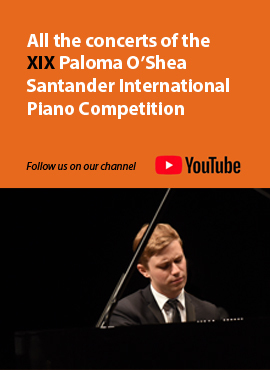 Santander, August 5, 2015.- This afternoon took place in the Argenta Hall of the Palace of Festivals of Cantabria the Closing Gala and Award Ceremony of the XVIII Paloma O'Shea Santander International Piano Competition. The event was attended by the President of the Government of Cantabria, Miguel Ángel Revilla; the Director General of INAEM (National Institute of Performing Arts and Music), Montserrat Iglesias; the Mayor of Santander, Íñigo de la Serna; and the President of the Competition and the Albéniz Foundation, Paloma O'Shea. At the beginning of the Ceremony, presented by Eva Sandoval, has played a piece by Rossini, "William Tell in Santander" (piano overture run for 12 hands)" with the six finalists. After the words of Mrs. Paloma O’Shea, Iglesias has delivered Award Finalist and Elena Martel, Comunication and Marketing Manager of Canon Spain, with the Notary Rafael Segura, have given the Audience Award which this year Canon has sponsored. Juan Pérez Floristán is the winner of the Canon Audience Award, consisting of a series of high-end Canon equipment and have been decided with the vote of those attending the Final held on 3 and 4 August in the Argenta Hall of the Palace of Festivals and through votes made online from websites www.classicalplanet.com and www.rtve.es. Juan Pérez Floristán, First Prize and Gold Medal. He received his distinction from the hand of the Director General of INAEM, Montserrat Iglesias. David Jae-Weon Huh, Second Prize and Silver Medal. She presented him with his prize by the President of the Government of Cantabria, Miguel Ángel Revilla. Jianing Kong, Third Prize and Bronze Medal ex aequo. Prize handed the Mayor of Santander, Inigo de la Serna. 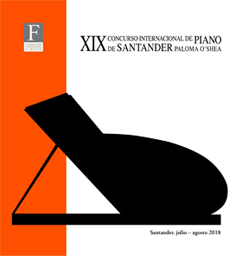 The Piano Competition benefits from the collaboration of numerous public and private entities: Department of Education, Culture and Sport - INAEM; Government of Cantabria; Santander City Council; International Festival of Santander; Fundación Albéniz; Fundación Botín; University of Cantabria; Publishing House Cantabria, El Diario Montañés; Viesgo; Fundación Banco Santander; Café Dromedario, S.A.; Canon; Managerial Group SADISA, S.L. ; Grupo Planeta; Grupo Tirso S.A.; Yamaha España; Hinves Pianos; Steinway and Sons, Hamburg; Hoteles Santos; Joyería Galán; Joyería Presmanes; Textil Santanderina, S.A.; Agua de Solares; Iberia; Alsa; Renfe; Volvo.